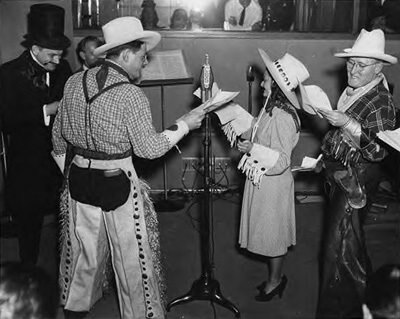 "On A Note of Triumph"
(announcer) during recording of a radio program. 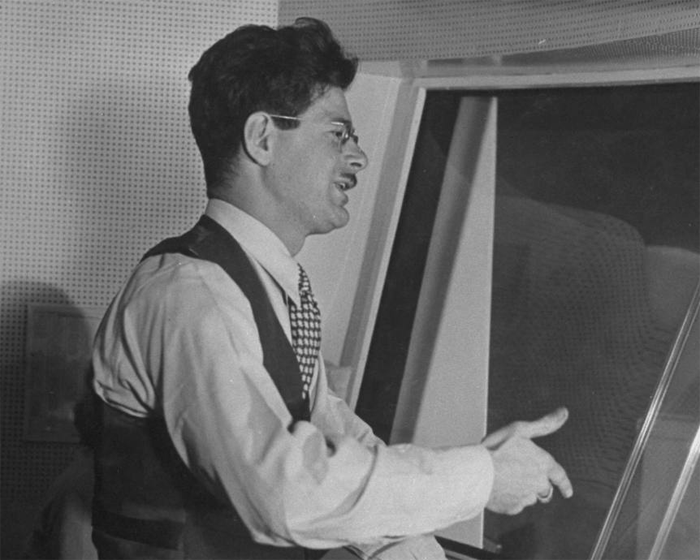 One of the greatest voices that has ever crept through the airways, Norman Corwin's poetic personality left an impression on the minds of whomever had the privilege of listening to his broadcasts. 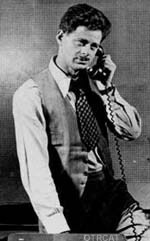 Sometimes called "Radio's poet laureate," Norman Lewis Corwin was born in Boston in 1910. Corwin's first taste of radio came when he was given a local commentator job. In 1938, Corwin moved to New York City and began to produce Norman Corwin's Words without Music. Corwin's career soon sky rocketed. In May of 1945, Corwin produced On a Note of Triumph, which many consider "one of the all-time great American poems." The poem was so widely spread that three months later, Orson Welles narrated 14 August, a V-J Day documentary.In 1948, Corwin left to write and produce a series for United Nations Radio. Norman Corwin's philanthropic contributions during the Second World War allowed him to be the beneficiary of two Peabody Medals, an Oscar Nomination, an Emmy, a Golden Globe, a Du-Pont Columbia Award, and the prestigious One World Award. In 1993, Corwin was finally inducted in the Radio Hall of Fame, where he will be immortalized for his work for generations to come. This collection chronicles many of his well-known radio broadcasts including: American in England, Corwin Presents, Columbia Workshop, Forecast, The Free Company, One World Flight, We Hold These Truths, On a Note of Triumph, This is War and Home for the Fourth. For more excellent policitally-charged productions, see also: Plays for Americans.